Trainers, rescue groups, adoption organizations, and shelters need to avoid liability for common accidents. And canine pros need to be compensated for their losses if attacked by a client's dog. 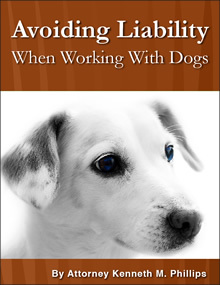 See Avoiding Liability When Working With Dogs. Legal documents for trainers, adoption groups and rescue groups. © 1999-2019 Kenneth Morgan Phillips. All rights reserved. Click here for further legal notices.